The men’s rugby team came up short under the lights last Friday night, losing to cross-town rivals McGill 18-6 at Concordia Stadium. “[A game with] McGill is always a rivalry. We are the two teams from Montreal and we hate each other,” said Concordia head coach Clive Gibson. The Redmen brought with them a rowdy contingent of fans who shouted down the Stinger faithful. That the two sides do not like each other was made evident by the five yellow cards handed out by the veteran referee, Martin Cormier. The lightning rod for much of the hostility was McGill second rower Max Gregory, who was on Cormier’s radar for much of the game. “Max is full of intensity, but he has to be careful with listening to the referee,” said Redmen coach Craig Beemer. The first 40 minutes of the game were dominated by unforced errors from both sides, although set pieces generally went ConU’s way. The sides traded penalty kicks to tie the game at three apiece going into halftime. However, the second half was all McGill. Led by some clutch kicking-for-posts by winger Nicolas Lefrançois-Santo, the Redmen tallied a penalty kick and a converted try to make the score 10-3. The Stingers responded with a penalty kick to cut the lead to 10-6 with 13 minutes left. While some might disagree with going for the penalty instead of the try, it was the resulting poor choices on the counter-attack that doomed Concordia. Despite some useful back-line play, ConU insisted on kicking possession away. 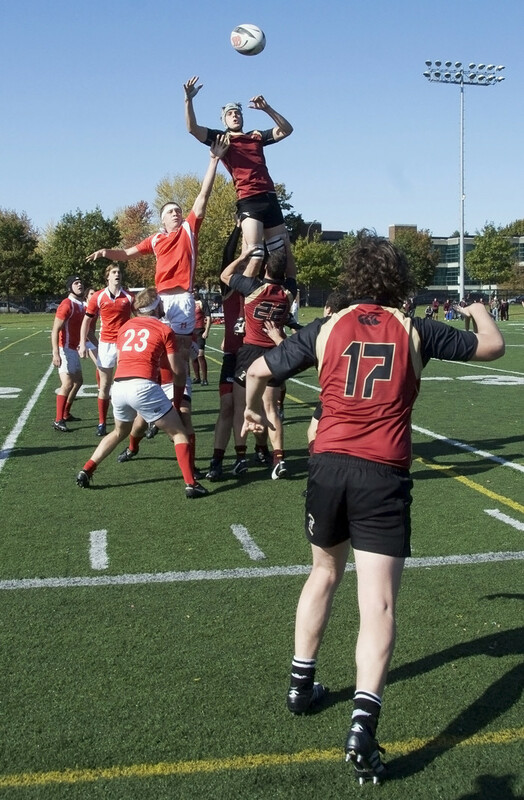 The last time this happened was late in the game and McGill capitalized with a storming try, which went unconverted. “Unfortunately for us, we came up short on a couple of the key points of the game. Kicking for position didn’t make a whole lot of sense,” said Gibson. McGill added a penalty late in the game to increase their lead and eventually reach a final score of 18-6. Despite the disappointing result, Stingers captain Edward McGregor is hopeful about the rest of the season. The Stingers will get a chance to prove their captain right this coming Friday, Sept. 24 against the Université de Sherbrooke Vert et Or at 7:00 p.m.